Hot dipped galvanized ¾ metal tree guards being fettled before painting at our workshop. These are the latest addition to our range and were designed primarily for utilitarian usage for smaller diameter trees. Protection from vandals, lawn mowers or use in car parks. We have sold many to councils, developers and landscapers for use in urban environments. This tree guard will also give good protection from larger deer but if you seek protection from monkjack, sheep or other stock you may wish to consider our Full Guard which has a greater diameter. 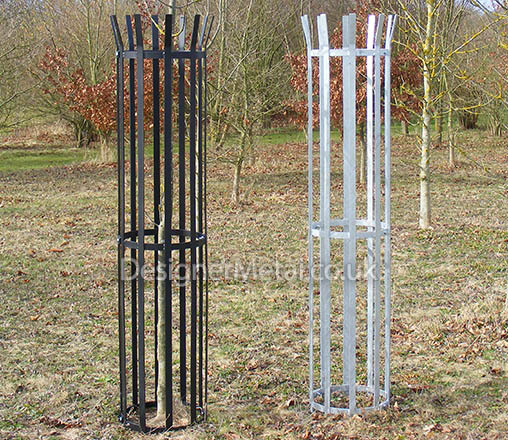 Three quarter sized iron tree guards offering protection from larger deer to sapling trees in a rural environment. We carry large stocks of these tree guards in all finished and they will usually be available for same or next day dispatch.